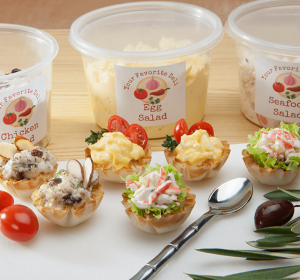 Chips and dip have met their match. 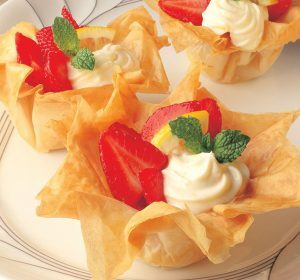 With phyllo shapes, you can cut, fold and butter your way to appetizer MVP status. Let’s start with the basics. Triangles — or turnovers, if you decide to make ‘em big — take about as much skill as you need to make a paper football. Stack two or three phyllo sheets together, layering cooking spray in between, and then cut into strips. Drop a tablespoon of filling at the end of one strip, and then start folding triangles until your dough is all used up. 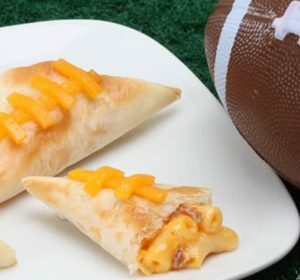 For game day, you can’t go wrong with these mac and cheese footballs … no fork required. Another option? 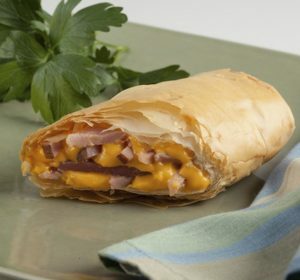 Create homemade Hot Pockets® with this ham and cheese strudel recipe. It takes next to no effort to roll up these cheesy apps. You can even make them ahead, and then bake off just before your guests arrive. Watch for step-by-step instructions; once you’ve got the hang of the fold and roll, you can fill your pocket with any meat, veg and cheese combo of your choosing. For a more sophisticated take on football party food, you can’t go wrong with beggar’s purses. Dollop a tablespoon-ish of a hearty dip — think buffalo chicken, French onion or creamy artichoke — onto a square of phyllo, gather up the corners, and then scrunch together to create a flaky bite. Tie off with a sliver of scallion for extra presentation points. If you’ve got a few sheets of dough leftover, stack them up to make a quick pizza crust, or pop a few squares in a muffin tin to bake up a lighter, more finger food friendly take on giant taco shells. Shredded chicken, black beans and rice, plus all the Tex Mex toppings, stay on theme, but you can also go sweet with a fruit filling a la these strawberry and lemon shells.